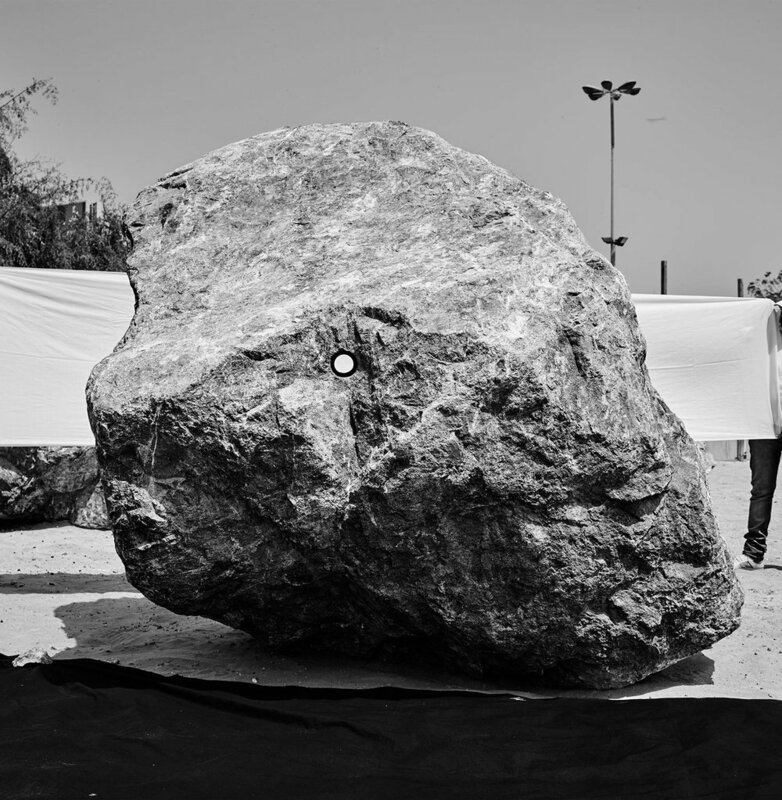 A public installation at the Shindagha Heritage Village in Dubai, Divecha’s Boulder Plot (2014), consisted of a carefully gridded arrangement of handpicked boulders sourced from the mountain quarries of Fujairah, on the UAE’s east coast, and destined to become building material for the region’s hyperactive construction industry. Photostaging Boulder Plot (2014) (2017) is a wry self-reflexive response to the pressing need to document such a monumental but ultimately temporary installation for posterity: once Boulder Plot was dismantled, each of its 24 boulders were sent to a crusher plant in Fujairah, where they were pulverised into aggregate. For it, Divecha staged black and white photographs of these boulders, using sheets of black and white cloth to isolate and set off their distinct jagged forms. Stretched taut behind the boulder, the white sheet makes the drill hole, an artefact of the rock blasting technique used to initiate excavation, markedly visible, transforming a line drilled through the boulder’s mass into a flat white circle, the undeniable punctum of each image. This subtly anthropomorphises the boulders, giving them an eye-like aperture through which they uncannily return and challenge our gaze, turning the photographs into portraits of a sort, the boulders’ status as inert objects made uncertain as they alternate between raw material, artistic prop and vibrant matter.